Large construction projects, migration or changing climate are just some growth drivers for the market of container systems. The demand for temporary accommodation in the most important regions in Europe can be found in our industry reports for containers and modular systems. The studies are based on information from the most important manufacturers of the industry, which are obtained by telephone interviews and questionnaires. Companies, with which we are cooperating during the survey, receive parts of the study free of charge, whereby a high rate of return can be guaranteed. This way, you receive valid figures on the market for containers and module systems and market shares of the top manufacturers. Our tailor-made forecasting models provide reliable forecasts for the coming 3 years. In our current market report, we show reliable market figures for the overall market of container and modular systems by country, which then are further broken down by the business segments: “Sale” and “Rental”. For the segment “Sales”, we further differentiate by “Container Systems” on the one hand (e.g. Storage Container Systems, Sanitary Container Systems, Office Container Systems, Living Container Systems, Others) and by “Modular Buildings” (“Office and Administrative Buildings”, “Kindergardens, Schools”, Residential Concepts, Health Care Institutions, Other Modular Buildings) on the other hand. Besides the segment Sales, “Rental” plays a quite big role for this industry. Therefore we also show a segmentation of Room Systems (Storage, Sanitary, Office Cabins, Living Rooms, Specials Room Systems, Other Room Systems); and also by Customer segments for this business segment. We already cover a series of European countries for our market research so far, but we can even conduct further countries based on your interest. Besides market sizes and development, in the competition analysis we also show the top companies with market shares for the surveyed markets overall and broken down by the different types of containers / modular systems. The market for container and modular building systems in five European countries (Austria, the Netherlands, Germany, Italy, and Poland) rose 5.0% (in value) in 2017, reaching a total market volume of nearly EUR 2.1 billion. According to a new study by Interconnection Consulting, the sector can expect significant growth in the coming years as well. Containers are in. Even the Austrian parliament will now be meeting in container systems for the next three years while the country’s time-honored parliament building undergoes renovation. The complex, measuring roughly 10,000 square meters of floor space, will hold approximately 450 employees. And after it is dismantled, the innovative modular construction system is expected to be employed elsewhere as schools, kindergartens, and single-family homes. Interconnection projects an average annual growth rate of 3.6% to 2020 for container systems in the five countries studied. Sales volume is thereby expected to increase to 5.7 million square meters. 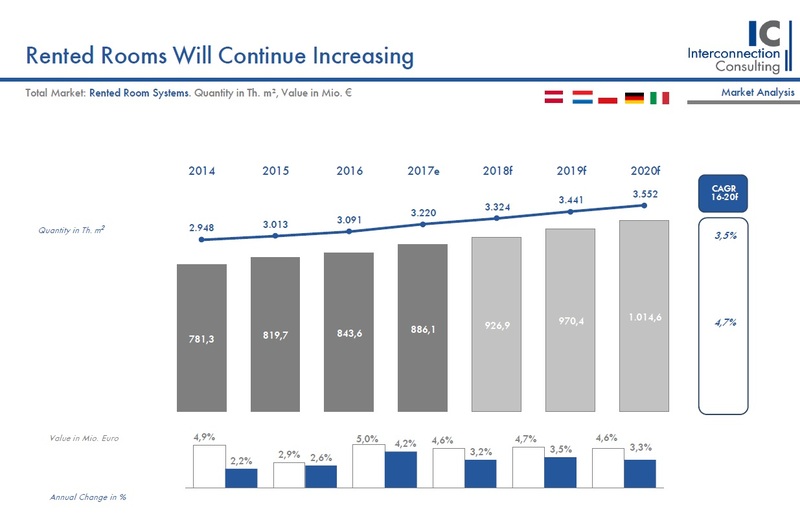 Container systems will increase their annual sales by 3.4% through the 2020 planning horizon. 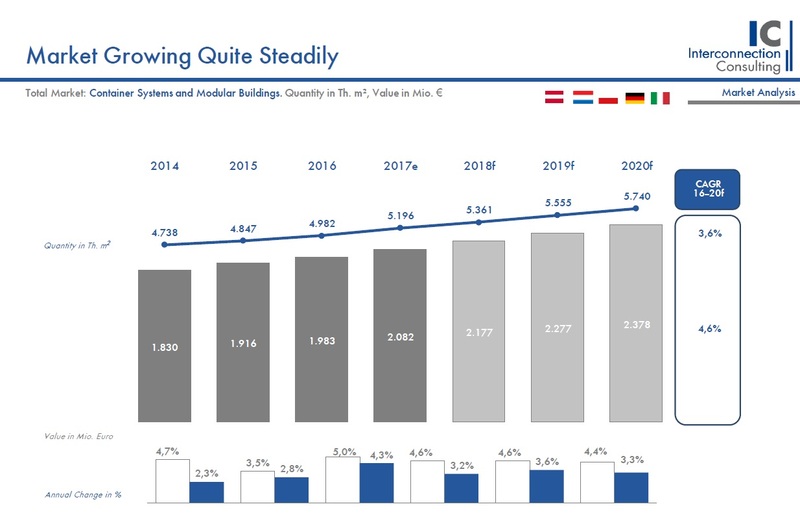 Modular building systems are expected to increase their sales by as much as 4.2% annually, though sinking prices will cause sales volume to rise more (+4.9% annually) than revenue. For rented room systems, the projected annual sales gains is 4.7%. Container systems reached a sales volume of 1.24 million square meters in 2017. Office containers constituted the largest client segment in both in sales volume (36.7%) and sales revenue (36.8%). Office containers can be used for office complexes, start-up offices, administration buildings, lounges, cafeterias, branch offices, building add-ons, advertising containers, construction site offices, in-factory offices, etc. Storage and material containers are the second-largest client segment, with a market share of 25.5%. Modular systems, which can employ partitioning walls etc., reached a sales volume of 0.73 million square meters. The largest client segment in this area is residential concepts, with a share of 29.2%. Rented room systems grew last year to a volume of 3.22 million square meters. In this area as well, office space is the clear market leader with a share of 38.0%. The share of rentals in terms of volume was 68%. The market for container rentals grew 5.0% last year. “From an economic standpoint, buying makes sense if you’re going to use a system for roughly 18 months or more,” explains Katarina Gajdova, author of the study. Rental periods vary greatly at individual companies, ranging from just a few weeks to several years. Poland witnessed the largest increase in the overall sector, with a gain in sales of 9.0%. The weakest development of the countries studied was in Italy, with a minimal increase in revenue of 0.4%. The strongest product group across all five countries was office containers. 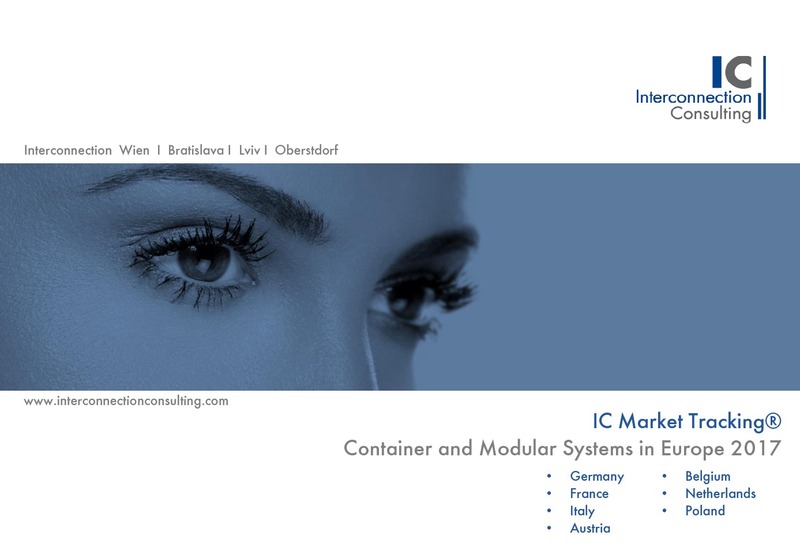 Interconnection expects this product group to see strongest growth in Austria (+4.2%) and Germany (+5.2%). In Poland, sanitation containers (+6.2%) are showing the strongest growth potential. In Italy, storage containers will see the largest growth (+1.6%), while in the Netherlands residential containers will (+4.1%). In 2016, market concentration by volume of the top 10 companies across all the markets studied was very low, at just 36.7%. In terms of the individual markets, Austria had the highest market concentration rate (83.7%), followed by Poland (82.8%). In Germany, market concentration was 44.8%, and in both Italy and the Netherlands the figure was 38.2%. Several important companies include Containex, Portakabin, StarCabin, und Touax.